This is the third post of the series. In the first post, I introduced my 5th great grandmother, Charlotte Richardson and the two competing theories as to who her parents were. In the second post, I outlined the process I followed to identify possible matches, in order to test the two theories. Now came the hard part – contacting people and getting them to agree to test. 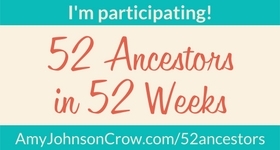 I tackled this in multiple ways, with help from Arthur Owen, another descendant of Charlotte Richardson and the person who first got me interested in genetic genealogy. The first thing we did was to try to get the word out. Even before I had completed Step 1, Arthur spread the word through mailing lists, research groups and forums. I put a note on the WikiTree profiles of Charlotte Richardson, Mary Flintoff, Jane Flintoff and Barbara Richardson, stating that I was looking for female-line descendants to test. We had a few bites, but they were all from people who were descendants but not along an all-female line. Some of them offered to pass the information along to people who would be candidates, but nothing materialized. I’d still recommend doing this though, as you never know who you might reach this way. Another way of reaching people was through cousin bait. I mentioned in the last post that one of the reasons I used WikiTree to document my research is because it’s excellent cousin bait. Sure enough, just a few days after I created the profile of one of Barbara Richardson’s descendants, I was contacted by a woman named Dana. She had been doing genealogy research and had googled her great-grandmother’s name and came upon the profile I had created. Dana contacted me to see if I could answer a question she had. While I couldn’t, I did take the opportunity to tell her why I had created the profile in the first place. While she was not a suitable candidate for my research, as it was her father’s grandmother, he was a direct female-line descendant of Barbara Richardson. Dana put me in touch with her father, Don, who kindly agreed to do the DNA test. Yay! I had my first tester! The third way I reached people was through direct contact. For this, I used Ancestry. I figured I’d have better luck finding someone to test by reaching people who at least had an interest in genealogy than by emailing people whose names I had read in an obituary, though I was prepared to go there if I had to. Once I identified some potential matches, I did a search in the Public Member Trees of Ancestry for the most recently deceased person in that line. I looked for people who had a lot of detail. I figured if someone didn’t know the name of a person’s spouse or where they were born, they were probably a more distant cousin and not a direct descendant. For those that did, I looked at the tree, to see if the member was indeed directly descended from the person I searched. To each of these potential matches, I wrote a short, carefully crafted message, explaining who I was, what I was trying to accomplish and how they were connected. I offered to pay for the test and to provide any additional information they requested. Most of people that I contacted never responded. But a full two months after I sent one query, I got a positive response, and I was in business! I now had two testers – one representing each theory. There are two mtDNA tests available at Family Tree DNA (FTDNA), called mtDNA Plus and mtFull Sequence. Note that these are the prices at the time I’m writing this post (January 2018) – they do change periodically. And there’s usually a sale around Mother’s Day, so if you’re not in a rush to test, it might be worth waiting for a sale. Prior to testing Pam and Don, I had already taken the mtDNA Full Sequence test and knew my haplogroup to be T2b, with some extra mutations (more on this in the next post). For comparison purposes, I started with the cheaper mtDNA Plus test for Pam and Don. This would be sufficient to rule out a match if, for example, their haplogroup was anything other than T. And if I had a match at that level, I could always upgrade to the full sequence test to confirm it. Tests were ordered, cheeks were swabbed and finally, after months of research and reaching out to numerous people, all I had to do was wait for results. And as you’ll see in the next post, it was worth the wait.